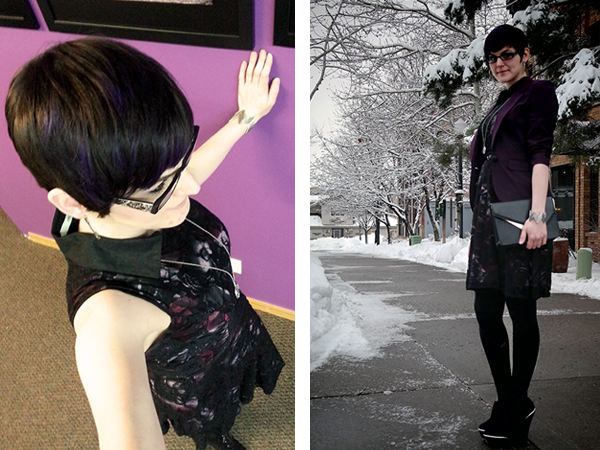 check out this post for the details on my pretty outfit. I had the pleasure of visiting the adorable Dani at Lunatic Fringe in Park City for a trim and a brush up on my hair color last Thursday; as always, she did a fantastic job. I love my pixie (usually), but my super thick + fast growing hair means a lot of upkeep and cuts, and after a year and a half, Dani is the only stylist I've found that I'm interested in going back to (three times, so far). I love her enough to pre-book my next appointment after each visit (now that's commitment). Prior to this, my last trip to Lunatic Fringe was in early December; in preparation for the slew of holiday parties The Boy and I were slated to attend, I decided to fork over the cash for a salon quality hair color session. Since the few experiences I've had with salon dye have been expensive and lasted just as long as box color, I usually dye my hair myself - but I'd finally plucked up the courage to add some wild highlights to my dark brunette locks and knew that professional help would be necessary. The purple came out looking amazing, but unfortunately, only lasted about three weeks (the sad truth of fabulous hair colors). The brunette, however, has stayed nearly as dark as the day we dyed it (almost two months ago now), which allowed us to simply brush a purple glaze over the lightened bits on Thursday. They're a tad bluer than last time, but they look great and after a week, seem to be holding better this time around. On top of her immense shearing talent, all of my appointments with Dani so far have felt more like hanging out with a friend than a business transaction. She's funny, talkative (but not annoyingly so), absolutely adorable and pretty damn entertaining. Most importantly, though, she's genuine - she remembers personal details from visit to visit, and cares just as much about the way I look when I leave as I do (something you don't often get, regardless of a hair cut's price tag). I haven't been to any of the other Lunatic Fringe stylists, but I've always had a good experience at the salon and if Dani were to leave (please don't! ), I would have no qualms about visiting one of their other professionals. 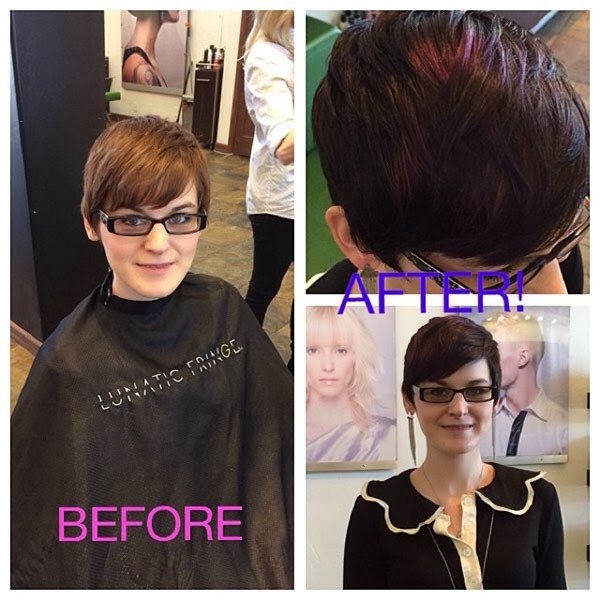 TLDR: Next time you're in the market for a hair cut, style or color, try Lunatic Fringe. If you can't make it to Park City to see Dani, they have two other locations in Salt Lake. Check out their website, www.lunaticfringesalon.com, for contact details and more info on the salon. 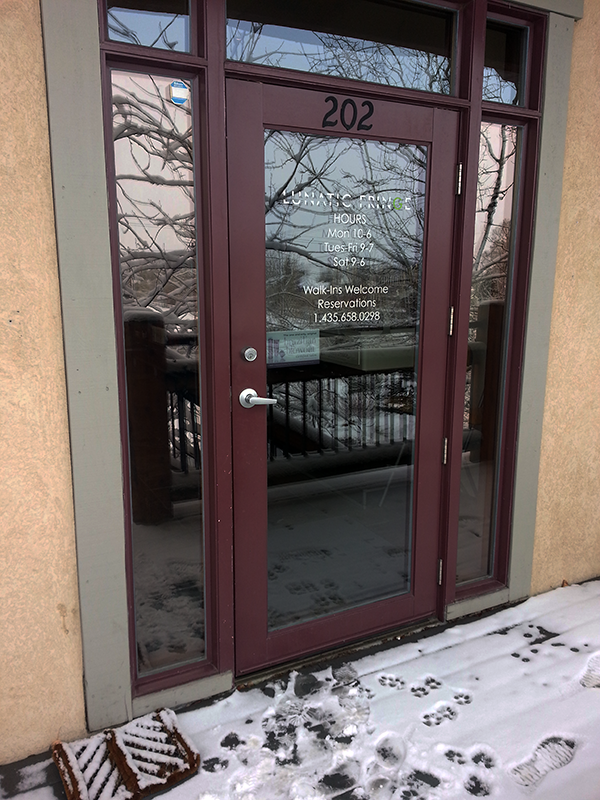 The Park City location is located at 4343 Utah Highway 224 in suite 202; their phone # is 435.658.0298. Has anyone else been to Lunatic Fringe? Share your thoughts in the comments below. Living P.C. is a new series of articles focusing on locally owned Park City businesses, including shops, restaurants, salons, spas and more. It will follow my shopping and life excursions as I get used to living in this resort town, and will feature businesses from the entire area (Kimball and Prospector in addition to downtown Park City). Consider it the local's guide to a tourist town. Learn more about it and check out all posts in the series here.